Several thousands of residents of Mostar gathered together on Sunday, as well as the previous four years, and overwhelmed the Rujiste site. 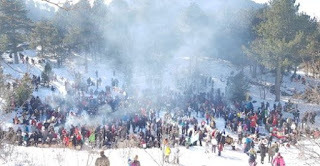 The traditional ‘Grahijada’ (an event where great amounts of traditional Bosnian bean are cooked) this year was organized by PSD Prenj from Mostar, and socializing and good fun were more important than prizes. Adnan Duliman from “Novi Val” Citizens Association from Blagaj, together with his team, tried to find the secret of the preparation of the best bean, hoping to win the prize. “Prizes are not important, but socializing in such a beautiful atmosphere. Nature is beautiful, it is not cold and the reason of gathering is nice, and we hope to win it, and if not, we will not try it next year again, “Duliman told Klix.ba news portal. Grahijada on Rujiste started for practical reasons, President of PSD Prenj, Sead Divanovic explained. Mountaineers are deprived of most activities, so these events like this fill up the time until the snow melts and the mountain tops will not be available to them again. They cooked in a freestyle, each had the freedom to choose which beans to use, and how to prepare it. The contest was limited to two hours. Prepared specialties were rated by a five-member jury made up of experienced mountaineers, with enviable experience in beans preparation. “This year, as it was the case last year, Grahijada was of a competitive character, 25 teams wanted to be the best. First place was taken by “Livac”, the second one was “Old Beans” and the third team “Gymnasium Mostar” , said Divanovic.